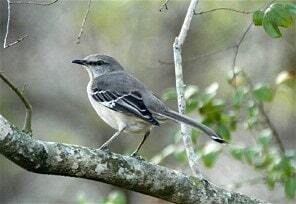 In spring the Northern Mockingbird may sing all night long. 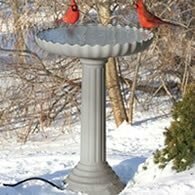 This bird will often fool even a well seasoned birdwatcher. Singing the songs of other bird species, the bird watcher has to listen closely to distinquish who is doing the singing. One unique habit of these birds is the defending of two separate territories. One is the breeding territory, which is typical for most birds. The other is their fall and winter feeding territory. Both are about 1 to 2 acres in size, although the feeding territory is generally smaller. Related to the catbird and thrasher, the name means "mimic of many tongues". 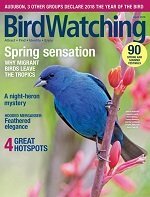 This bird is able to imitate more than 30 bird songs in succession. Other sounds such as squeaky hinges, barking dogs, and chirping crickets are also imitated. They measure about 9 to 11 inches in length. Slender with a long tail. Gray above and whitish below. The outer feathers of the tail are white. Two wing bars on each wing and large white patches under wings visible in flight. Males generally establish a nesting territory as early as February onward. Unmated females remain longer on their wintering territory while some pairs may stay together during winter sharing territory . The primary breeding season is between April and July although it can extend a month on either side. As soon as a female enters an umated males territory, the male challenges her with a harsh "chacks". The two birds square off and watch each other. The male pursues the female, and if she leaves he may try to entice her back with spread wings and soft calls. The female will eventually select a mate or reunite with a male from the previous season. Once a pair bond is established, the songs are shortend and more subdued. Sitting together quietly both mockingbirds make a "hew-hew" call to keep in contact. 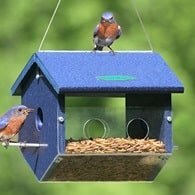 These birds are strongly monogamous. If a male fails to find a mate he will sing loudly until late in the season. If no mate is found he will abandon his territory. The nest construction of the Northern Mockingbird is done by both the male and female. Although the male does most of the work which is less common in other birds. The nest is built within 2 or 3 days. Five or six nests may be built during the annual breeding period. The nest is a bulky structure of twigs upon which a compact mass of leaves, grasses, moss, hair, or artificial fibers is placed. The interior cup is lined with fine, soft rootlets, wool or bits of string. Located about 3 to 10 feet above ground. The female lays 3 to 5 pale blue or green eggs that are blotched with russet or cinnamon. She then incubates the eggs about 11 to 13 days. Both parents feed the hatchlings for about 12 days. Are Mockingbirds or Other Sounds Driving You Nuts! The entire procedure of incubation and fledging approximates between 23 to 25 days. 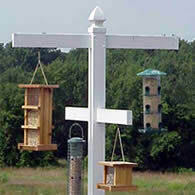 These birds feed on fruits and berries of holly, smilax, woodbine, sumac and other plants. Some garden and horticultural crops such as grapes, blackberries, and figs, are also favorites of this bird. 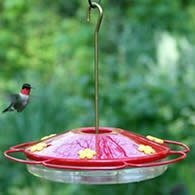 In addition to fruits, this bird also eats harmful weevils, cucumber beetles, chinch bugs, and grasshoppers. So while many think this bird is detrimental to fruit crops the truth is, it is an important bird in an agricultural sense. Northern Mockingbirds will defend their feeding-winter territories against other birds such as Robins, Starlings, and woodpeckers who also compete for fruits.